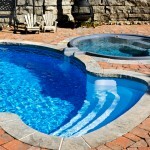 If you’d like to learn more about fire pit paving in Mooresville, contact us at Lake Norman Signature Pools & Patios. Fire Pit Paving in Mooresville – When you turn outdoor living space into an area that feels like an oasis, you and your family members are much more likely to use the space. Adding a new fire pit will provide unmatched ambience to your patio or deck, and you can invite loved ones over to enjoy the roaring fire during the cooler fall and spring months. Here in the Mooresville & Lake Norman, North Carolina area, we are lucky to have pleasant weather all year, so fire pits are very popular. At Lake Norman Signature Pools & Patios, we offer fire pit paving services and can create visually appealing fire pits that you can use to toast marshmallows or simply enjoy the heat they provide. Some even believe that fire pits tap into our primal instincts to gather around a fire and enjoy time together, as our forefathers have done for many years. If you have nearby neighbors, you can sit together with a favorite drink and get to know one another better. There are quite a few options when it comes to fire pit paving. You can choose from various colors of bricks, stones, and more. We can also help you choose fire pit paving options that will complement the exterior of your home, as well as materials that help to extend your interior kitchen to your outdoor space. If you are looking for a quiet place to sit and think about future endeavors or past events, a fire pit is the perfect spot that doesn’t even require you to leave home. For more information about fire pit paving, contact us today at Lake Norman Signature Pools & Patios. At Lake Norman Signature Pools & Patios, we proudly offer fire pit paving services in Mooresville, Cornelius, Davidson, Denver, Huntersville, and Lake Norman, North Carolina.